Chris works at the Recreation center at UCSB. 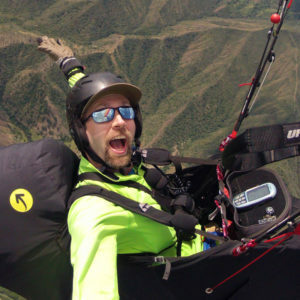 He began flying with us 2011 when Eagle was working with UCSB doing paragliding activities for students. Chris is an exceptional instructor, and he has put many hours into working with Eagle. He is a natural teacher, and his ability to get his students to succeed quickly is a testament to his passion and skill as an instructor. Kids and younger pilots always seem to gravitate towards Chris, as do all other students. He gets loads of requests by students who worked with him on their first day who want him as they return for certification. Chris has been guiding on our Colombia tours as well. We realize we needed to get him on board to guide on the Colombia tours after he was finding all the thermals saving the day when we got low. We call those low saves, and Clontzy is the king of low saves in Colombia. Skills – Pilot Certification, Cross Country, Presentations, Tour Guiding, Communication, XC Instructor, Ground school specialist.